Go to SharePoint site where you want to add the Mini Calendar and open “Site Actions - Edit page”. You will switch to edit mode. Click “Add a Web Part”. 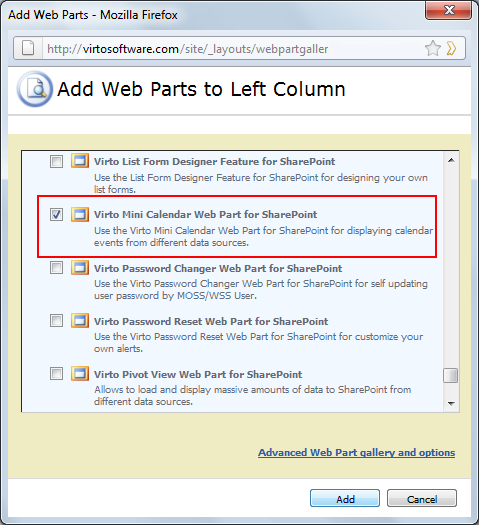 Select Virto Mini Calendar Web Part at the bottom of the list and click “Add”. Once you have clicked “Add” button, use “Exit edit mode” button. Note: when a web part Mini Calendar is being added, the current web-site is scanned for lists of Mini Calendar type (or events). If there are any lists of this type, they events will be already added to the Data Source of new Mini Calendar.